They are New England’s voices of autumn, Gil and Gino, their surnames well known yet unnecessary thanks to their 28 years - the last 21 consecutively - as the Patriots’ radio broadcast team. 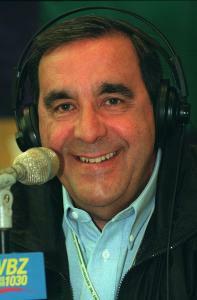 Gil Santos, the play-by-play voice with the golden baritone, and Gino Cappelletti, the analyst and classy Patriots legend, have long been the trusted game-time audio companions for Patriots fans charged with raking leaves or driving around on errands or simply for those who sometimes prefer the theater of the mind to the theater in the living room. Their rapport feels authentic, like genuine friendship, because that’s what it is. Santos never fails to greet Cappelletti’s handoff to begin the broadcast with a booming “Thank you, mon ami.’’ At their best, the listener surely felt a similar sentiment for them. But that sentiment is waning. Santos and Cappelletti’s gaffes and moments of befuddlement have come in a greater volume this season. And while many are minor - misidentifying Danny Woodhead as Wes Welker and vice versa, or reporting a pass was caught by no one when it was indeed completed, or Cappelletti’s meandering analysis - when they are greater in abundance, they become distracting and eventually aggravating, and the broadcast suffers. It’s a delicate situation, but one that has reached a point of diminishing returns. The conclusion is harsh but obvious. This should be Santos and Cappelletti’s final season calling the Patriots. It is difficult to acknowledge that about a broadcast team with such a legacy. Santos called Patriots games from 1966-79 before returning in 1991, and his 35 years ties him with the Eagles’ Merrill Reese for the longest current stint calling a team’s games. Cappelletti was paired with Santos from 1972-78 and has had an uninterrupted stint on the broadcast since 1988. They are icons, and their employer recognizes them as such. While CBS Radio, which owns the Patriots’ flagship station, 98.5 The Sports Hub, has not commented on its intentions beyond this season, it should be said that it has handled Santos and Cappelletti’s status with extraordinary fairness thus far. It would not be a surprise if both men are offered sort of a broadcaster emeritus role, a la Frank Gifford on “Monday Night Football’’ a few years ago, when their days in the booth are done. Mark Hannon, CBS Radio Boston’s senior vice president and market manager, and Sports Hub program director Mike Thomas have left it to Santos and Cappelletti to decide their status the past couple of years, though the addition of Scott Zolak as a sideline reporter/second analyst for the 2011 season was a telling clue that they felt some enhancement was necessary. Zolak, the former Patriots quarterback and midday co-host of the “Gresh and Zo’’ program on The Sports Hub, has been a revelation in the role. He is the heir apparent to Cappelletti, and working him into the broadcast in an innovative way has eased the eventual transition. What’s less obvious is the successor to Santos, who is expected to be more resistant than Cappelletti when it’s time to turn off the microphone. Industry sources believe Gary Tanguay is in line for the job, which would explain why he departed without rancor when he was replaced by Andy Gresh alongside Zolak on The Sports Hub’s midday show in April 2010. Like Santos, Tanguay, who hosts the pre- and postgame shows, has the classic pipes, but he comes up shy of a first down when compared with Santos in his heyday. This transition would not be akin to the instantly excellent Sean McDonough arriving to replace Ned Martin on Red Sox broadcast in the late ’80s. The best sports broadcasters usually have career longevity. In particular regard to Santos, context comes when one realizes he called not just the inaugural games of Tom Brady and Drew Bledsoe’s careers, but the debuts of Patriots quarterbacks Jim Plunkett (’71) and Steve Grogan (’75) as well. (Cappelletti joined the booth in ’72, a year after Plunkett’s debut.) But the coincidence is that when broadcasts begin to slip, it’s similar to what occurs to an aging player. The pace of the game accelerates on them. They don’t see the field as well as they once did. It becomes harder and harder to keep up with the action. Unless you’re Vin Scully, apparently, such a regression happens to everyone. Consider: When Santos and Cappelletti first worked a Patriots game together in 1972, Bob Wilson was calling the Bruins, Johnny Most was the caterwauling voice of the Celtics, and Martin and Ken Coleman did the duties for the Red Sox. Wilson was the most recent of that remarkable group to call a game for his respective team, and that was during the Bruins’ 1994-95 season. The microphone does not stay on forever, even for the best of the best. Santos and Cappelletti do still have their very good days. Last Sunday was one. The Patriots, as Brady put it, played their most complete game of the season in a 41-23 victory at Denver, and coincidentally, it was Santos and Cappelletti’s best broadcast of the season. While there were occasional delayed identifications of pass receivers and the down and distance didn’t always agree with what the television screen showed, mistakes were not egregious. And Santos’s call of Chad Ochocinco’s long-awaited first touchdown as a Patriot was outstanding. “Guess who?’’ he boomed. “Chad . . . Ocho . . . CINCO!’’ expertly drawing out the syllables to match the magnitude of the moment. It was a pleasant flashback. It was also the exception. It won’t be the same when Santos is no longer authoritatively intoning that the Patriots “are going left to right on your radio dial . . . Brady operating out of the shotgun, two receivers to his left, Welker in the slot . . . ’’ or when Cappelletti is gamely rattling through the rest of the scores around the NFL in the seconds between plays. But then, it’s not the same now. They’ve seen Plunkett and Grogan and Bledsoe and so many more pass through. They know how it goes. The game slows down for no one. Not even Gil and Gino. Survey Should CBS change Pats' radio announcers? Globe 10.0 How will Pats deal with losing Carter?